Since I still can't get around well I'm stuck in bed for two weeks, I haven't been able to get a lot done this week. The laundry is piling up, groceries need to be bought, rooms need to be cleaned, dogs need to be petted... I'm very frustrated that I can't get around. One thing that didn't require a lot of moving was a simple project, sort of. The Princess wanted some special nails for the start of school. This wasn't a big project by any means. 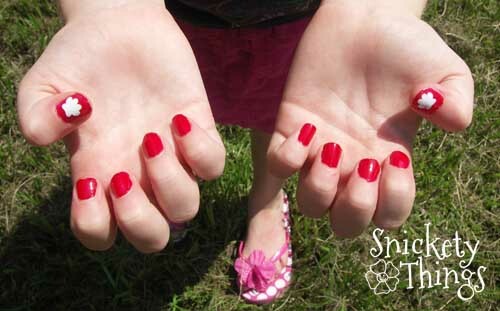 It was more difficult to get my girls to sit still while I painted their nails than coming up with a design. I used a much smaller version of the paw print from the pencil buckets and the dog treat jar. It still wasn't tiny enough for their little fingers, but fit their thumbs perfectly. I had cut the tiny paw prints out a few weeks ago when I was playing with sizes so I already had them on hand. The school colors are red and white so I used a red nail polish base and white vinyl for the paw print. It is topped with a clear coat. Here is a close up of the Princess's nails. I painted them on Tuesday and by Thursday almost all the paint was off their fingers. They just don't know how to take care of a manicure. Have any of you done special nails for the start of school? 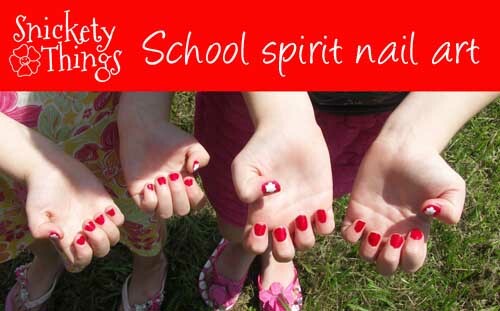 I have never even thought of doing back to school nails-super fun idea! Cute idea, we've never done anything like that for the start of school. Our colors are burgundy and gold so I don't know how cute that would look! Mine can't keep a manicure for more than a day either so I don't even bother to try and tell her to be careful. One thing I have found that using nicer brands like OPI, which is alot more $$$ than the dollar brands I was buying for her, do seem to stay on longer. 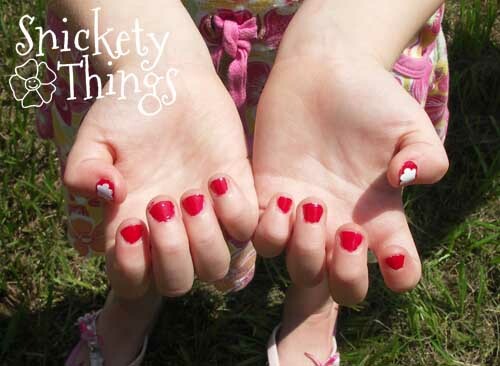 Thank you for sharing your back to school nails at A Crafty Soiree! I think burgundy and gold would look very nice! I am afraid to put OPI on either of them because I didn't want to spend all the money for those colors. I've been buying the ICE colors at Walmart. Maybe I could invest in a better top coat. Those nails above only lasted two days.